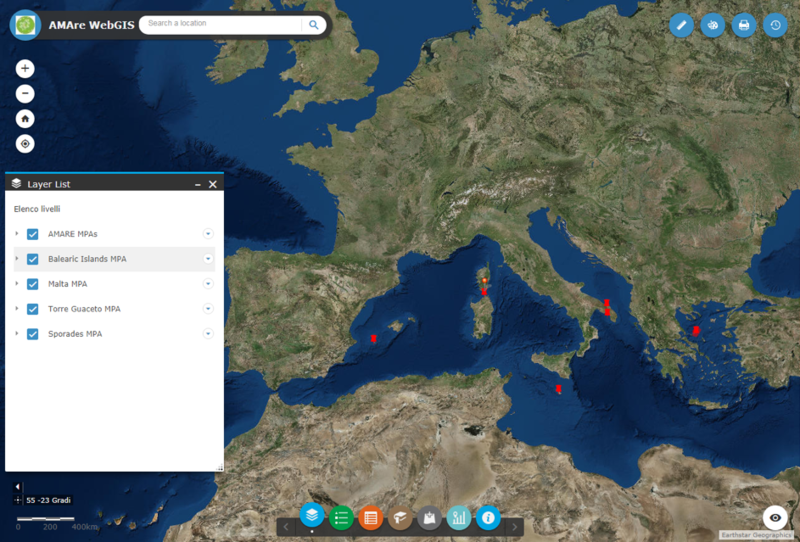 The AMAre Geoportal was developed within the Interreg-MED project AMAre, to provide a spatial database to store, manage and share data on four MPAs involved in the project (Sporades, Malta, Balearic Islands and Torre Guaceto). 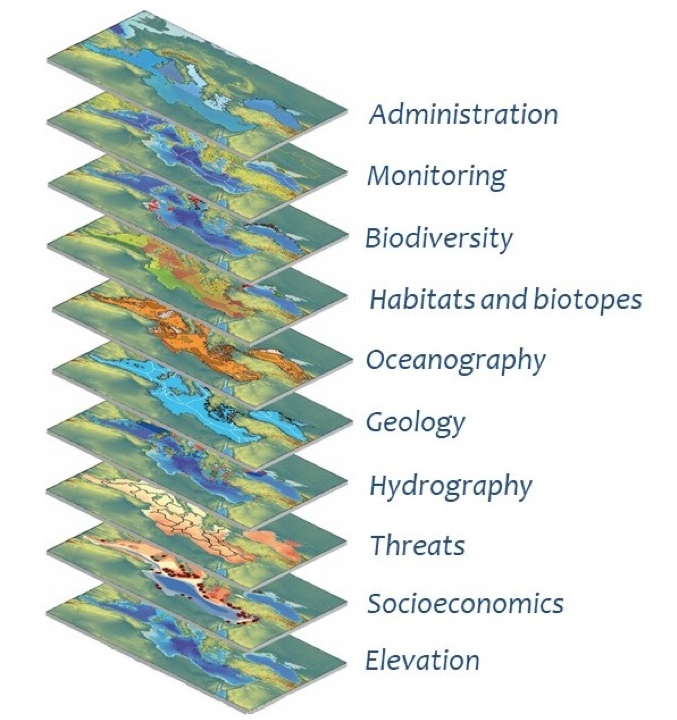 The Geoportal combines Geographic Information Science (GIS) principles and tools to harmonize a relatively large and multi-dimensional dataset, including several themes: administration, biodiversity, elevation, geology, habitats and biotopes, hydrography, monitoring, oceanography, socioeconomic, threats. The tool combines web maps with graphs, charts, tables, and text to make accessible and re-usable the data relevant for the management of the MPAs in a coordinated manner. What spatial data are relevant for management of Mediterranean MPAs? How can these data and related metadata be organised and made publicly available to users? AMAre Geoportal was developed in the context of the Interreg-MED AMAre project aimed at the identification of possible strategies and solutions to improve the effectiveness of marine environment management in the Mediterranean. The geoportal was implemented following the INSPIRE Directive conceptual model, whose main goal is to enhance environmental spatial information sharing. To store, manage and share spatial data relevant to MPAs management in the Mediterranean. To facilitate the assessment and analysis of environmental features and socio-economic activities with potential impact on the marine environment. To provide publicly available information on the management framework, monitoring facilities, environmental and socio-economic aspects within different Mediterranean MPAs. The Geoportal was developed through the integration of spatial data with non-spatial information such as graphs, charts and tables relevant for MPA management. ArcGIS software was used to create a common geodatabase. The structure of the Geoportal was designed in accordance with the needs of the MPAs involved in the project (Sporades, Malta, Balearic Islands and Torre Guaceto). The information of the geoportal can be publicly accessed for a personal use on desktop through the Web Map Service (WMS) services. The WMS services provide different URL addresses, each one including the layers related to a specific MPA, while all the layers and related information for the MPAs are merged in a single Oracle database, accessible only by the project partners, that is the data source of the AMAre Geoportal. The figure below shows the list of thematic layers included in the geodatabase and publicly available in the AMAre Geoportal. Each layer of the Geoportal has its own metadata form, which may describe and document: its subject matter; how, when, where, and by whom the data was collected; availability and distribution information; its projection, scale, resolution, and accuracy; and its reliability with regard to some standard. The main contents provided by the Geoportal are spatial information collected for the MPAs considered in AMAre project, and related metadata. Geoportal spatial data can support planning of the MPAs at the local level and can also be used in an MSP exercise at the broader scale (e.g. sub sea-basin or sea-basin level), to represent the specific characteristics of these areas of high ecological importance. The Homogenized data included in the Geoportal ensure coherence across different MPAs. Administration elements including boundaries and zonation of the MPA, jurisdictional waters limits, and other type of spatial delimitations (e.g. Natura 2000 areas). Monitoring elements, including location of monitoring stations or buoys. Distribution of marine and terrestrial habitats. Oceanography features, providing data such as sea surface temperature, chlorophyll and water transparency. Geological characteristics of the coastline and the underwater areas. Hydrography aspects such as rivers and drainage basins. Main threats on the marine environment, identifying areas with human activities generating potential negative effects, such as ports and water outfalls. Socio-economic information including land and sea uses. Elevation characteristics including bathymetry and hillshade. The spatial layers included in the Geoportal are accessible through a Web Map Service (WMS) which allows users to visualize them through the common online GIS services. Metadata on the spatial layers included in the Geoportal are made available for download through a metadata catalogue. The Geoportal spatial layers will be integrated in the PANACea project common infrastructure, the Mediterranean Biodiversity Protection Knowledge Platform, a virtual space in which the main outputs and results from projects related to marine biodiversity protection in the Mediterranean, funded through the Interreg MED 2014-2020 programme, are gathered and disseminated. 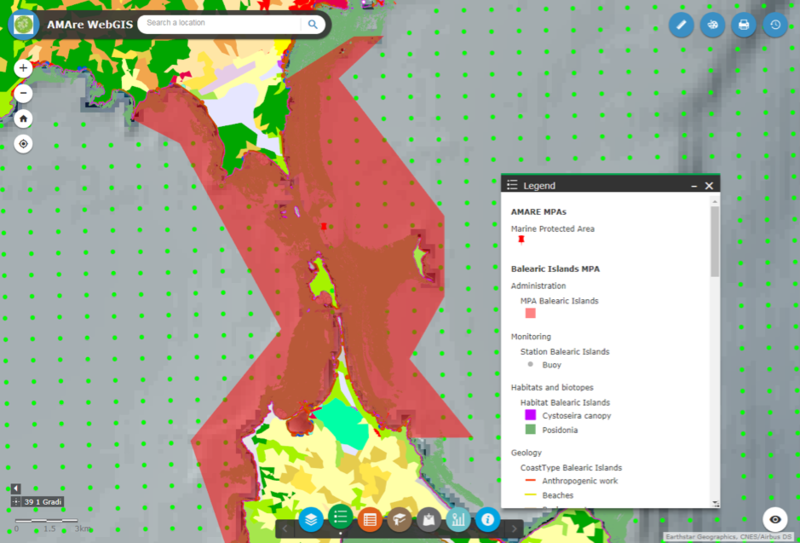 The Geoportal was designed in order to be updatable with new spatial layers and information related to the MPAs included in the AMAre project. Further, in accordance with the long-term objective of the AMAre project to share homogenized data for a coordinated management of MPAs in the Mediterranean Sea, other MPAs can be included in the Geoportal. A similar approach to data collection, sharing and homogenization can be used to manage spatial information on MPAs included in other sea basins.